When the Trust was invited by Alan Alder, one of the regular presenters on Cambridge105’s Saturday food programme Flavour, to participate in a feature on food-related books in Cambridge libraries, we thought why not. 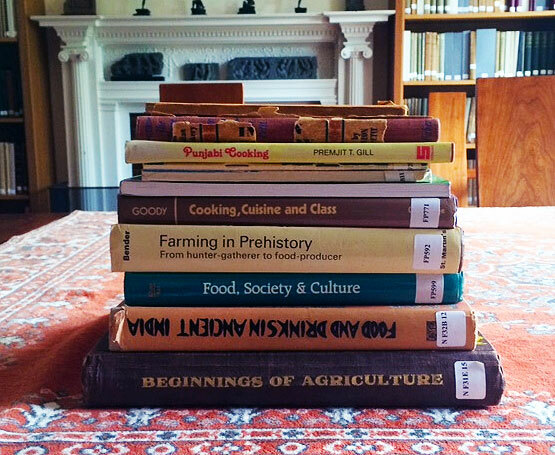 Although we are not known for our gastronomical collections, it was interesting to note how many books we discovered that were not just cookery books, but also included content on the social and cultural aspects of food in Indian, Zoroastrian and Central Asian life and history. 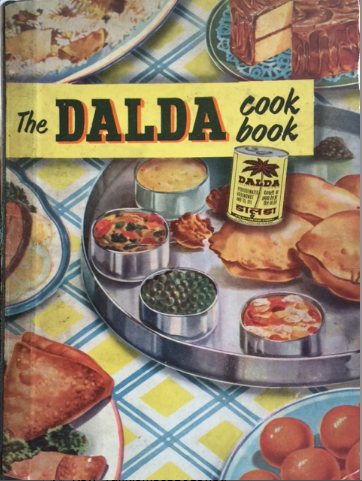 From the collection of two of our founding Trustees, Raymond and Bridget Allchin, there are cookery books such as Punjabi Cooking (Gill, P.T., 1984), and South Indian Recipes (Neela, Miss R., 1950); small volumes, mostly un-illustrated (with the exception of The Dalda Cookbook / Dalda Advisory Service, Bombay, 196?, see photo below) and densely packed with everyday recipes for roti, rice, dals, pickles, koftas and halwas; as well as many vegetarian and meat recipes for more substantial meals, including one for ‘curried partridge’ (p.67, Punjabi Cooking / P.T. Gill). Less unusual titles from the collection of two eminent archaeologists, are those on ancient food gatherers, hunters and farmers in ancient India, including; Food and Drinks in Ancient India (Prakash, Om, 1961, N F32B 12) and From Hunting and Food Gathering to Domestication of Plants and Animals: Beginnings of Agriculture (Sharma, G.R. et al, 1980, N F31E 15), which illustrate the story of subsistence from the earliest civilisations of the Indian subcontinent up to 1200 A.D.
Our collection from another archaeologist, Gregory Possehl, also includes both archaeological and anthropological books with themes that include: ancient farming and food-production, in Farming in Prehistory (Bender, B., 1975, FP592); cultural comparisions of the development of culinary practices around the world in Cooking, Cuisine and Class: a study in comparative sociology (Goody, J, 1982, FP771); studies of the development of food production in Aspects in South Asian Food Systems: Food, Society and Culture (Khare, R.S. 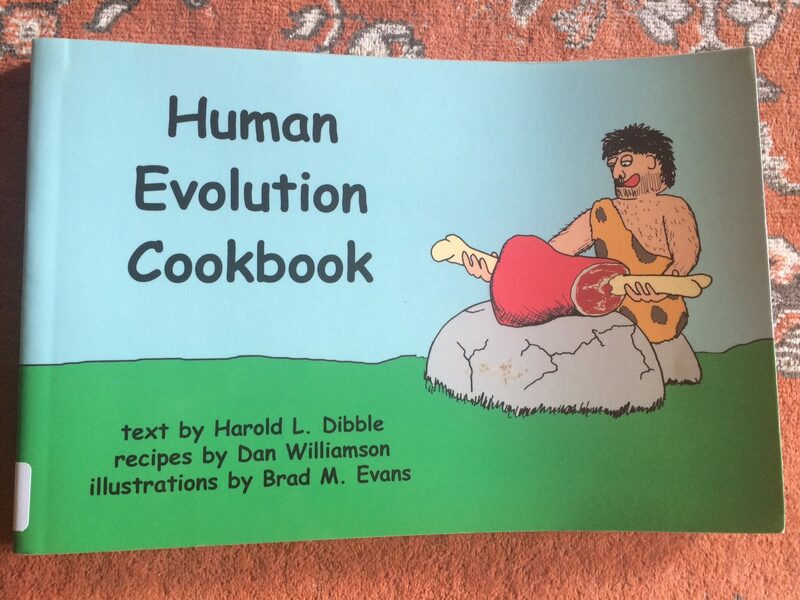 & Rao, M.S.A., eds., 1986, FP599) and the superbly titled Human Evolution Cookbook (Dibble, Harold L., Williamson, D. & Evans, B.M., 2003, FP975), which claims to combine “…a dash of prehistory, a sprinkle of recipes, and a generous helping of humor…” and includes tempting recipes such as ‘Serengeti Scavenged Stew’ (see photo below), ‘Neanderthal Nibblers’ and ‘Glacial Gravlax’! Two of the more unusual food-related titles in our collection are from the collection of Mongolian studies material, donated to the Trust by Charles Bawden. Published in Cyrillic script, Malyn tsusyg khu̇nsėnd khėrėglėkh nʹ (translated as ‘Using animal blood in food’) by TS. Gėndėnzhamts (1986, M F28H 18) and Khu̇nsniĭ bu̇tėėgdėkhu̇u̇n khadgalakh mȯsȯn zoorʹ (translated as ‘Food products [of/in] cold storage’) by N. Lonzhid (1986, M F28H 23) are guides to the processes involving the preservation of blood for use in food, rather than books that contain specific culinary references. Historically, dating back to Genghis Khan, it was seen as taboo in Mongolia to spill or waste blood (see Francis Woodman Cleaves, The Secret History of the Mongols (Cambridge, MA, 1982, A15G 27), 140; also, Marco Polo, The Description of the World, eds. Moule & Pelliot (London, 1938, F44F 2) I, 199-200;) and thus publications that instruct on the preservation and use of blood do not seem that unusual in the reference collection of a Mongolian scholar. Within the Trust’s Persian collection are many references to Parsi food. There are guidelines in the Videvdad (Vendidad), within the sacred texts of the Avesta (B8A 60), emphasizing that people should eat and drink well so as to prevent their bodies from becoming weak and diseases to develop. Two articles on ‘The eating habits of the Parsis’ (Chalo, Jamva, pp 521-534) and ‘Parsi cuisine in the villages of Gujarat’ Dalal, Katy, pp 535-539), in A Zoroastrian Tapestry: art, religion & culture (eds. Godrej, Pheroze J. & Mistree, Firoza Punthakey, 2002, B8A 61). 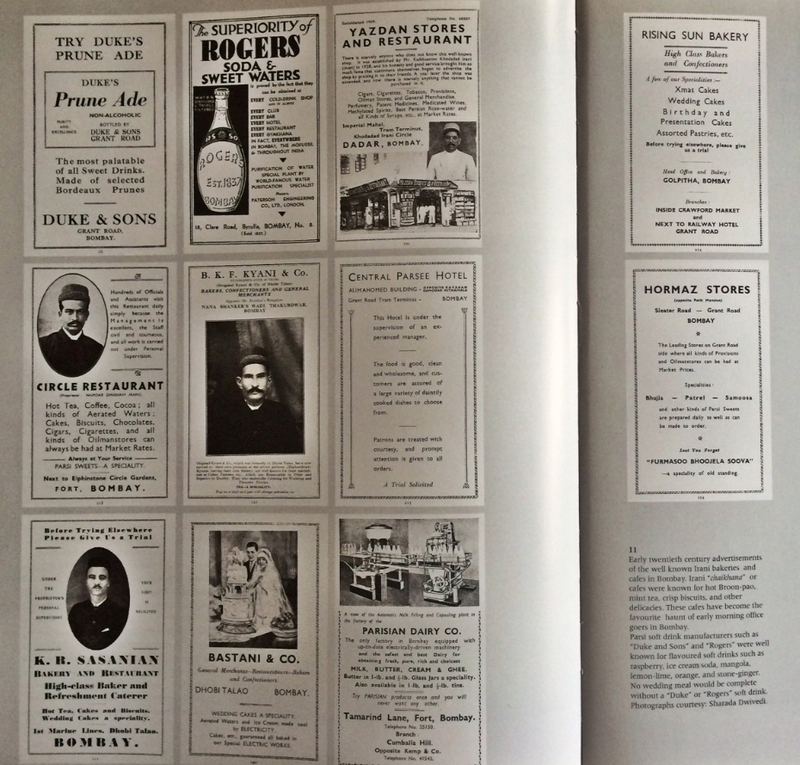 Both articles are illustrated and include some wonderful photographs of ‘…early twentieth century advertisements of the well known Irani bakeries and cafes in Bombay.’ (529, photo below). 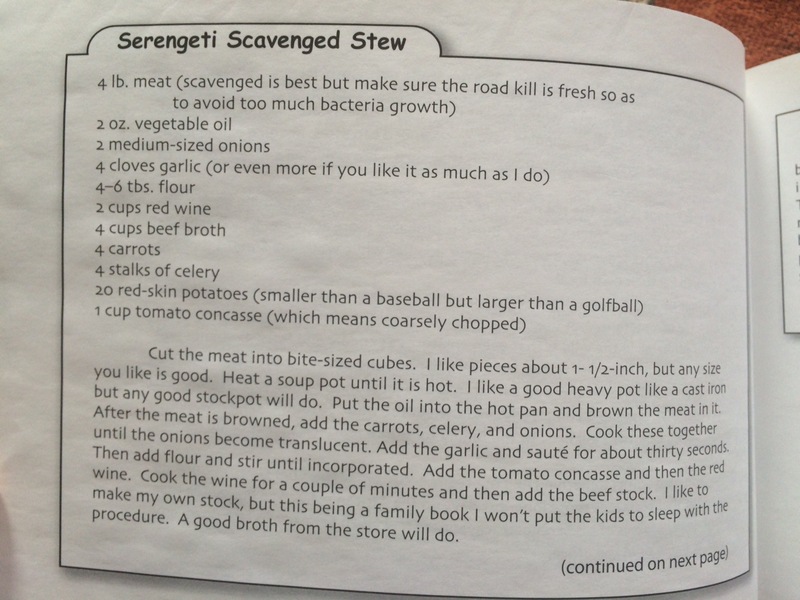 The selection of books discussed on the programme ranged from Indian cookery books of the 1950s (all filled with recipes and nutritional advice); to Mongolian practical guides on how to store blood for cooking; to Parsi cuisine and the contrast between advice in the ancient Zoroastrian Videvdad texts and an online book of Zoroastrian recipes for feasts, celebrations and religious ceremonies, entitle Eat, Live, Pray. This recent publication included a feature on wine, which reminded us that Shiraz is a city in southwest Persia, and the grape was exported from there to countries around the world. It also has a recipe for Chai Creme Brulee, stating that it is also known as ‘Trinity Cream’ or Cambridge Burnt Cream, after the college where it debuted – something we thought was well worth a mention! That the discoveries we made, whilst researching for this feature, were so diverse and not all scholarly in content highlights that when we accept collections of books into our library they can be eclectic and go well beyond the realm of the subject specialism, or that academic’s area of expertise. For those of you who haven’t already tuned in to Flavour, it is aired fortnightly on Cambridge105 at 12pm and you can listen to a podcast of the edition that featured Alan’s conversation with our librarian, Jo Salisbury, which aired on Saturday 14th May. A great bit of lateral thinking. Well done Jo.